Almaz-Antey said any kind of tampering with radar data "would be clearly visible to any specialist"
MOSCOW, April 4. /TASS/. Russian arms manufacturer Almaz-Antey, which designed the Buk missile system, has rejected investigators’ claims that the missile that downed the Malaysian Airlines Flight 17 (MH17) in eastern Ukraine in 2014 could be invisible for Russian radars. 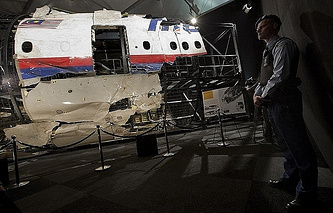 Dutch prosecutors said earlier on Tuesday that an international team investigating the MH17 incident came to a conclusion that the missile that hit the ill-fated plane was moving too quickly to be picked up by Russian radars. "It is impossible to amend primary file data in any way without destroying its structure," Almaz-Antey said. "Any changes of this kind would be clearly visible to any specialist." Malaysia Airlines Flight MH17 on a flight from the Dutch capital city of Amsterdam to Malaysia’s capital Kuala Lumpur crashed on July 17, 2014 in Ukraine’s eastern Donetsk Region in the zone of combat operations between the Donetsk self-defense forces and the Ukrainian army. All the 283 passengers and 15 crew members, nationals of ten countries, died in the crash. Most of the passengers - 196 people - were Dutch citizens. The Ukrainian authorities and the people’s militia of the self-proclaimed Donetsk People’s Republic (DPR) accused each other of downing the plane. The Joint Investigation Team (JIT), bringing together experts from Australia, Belgium, Malaysia, the Netherlands and Ukraine, is conducting a criminal investigation into the crash. In September 2016, it issued the results of its probe, claiming that that the missile that brought down the plane was launched from a Buk air defense system near the township of Pervomaiskoye in the south of Snezhnoye, which at that time was under the control of the eastern Ukrainian militias. The Russian analysis of the primary radar’s data refutes the possibility of a missile launch targeting the Boeing from the area to the east of the crash scene, including from Snezhnoye. Russia’s representatives have expressed dissatisfaction with the course of the investigation on numerous occasions saying that the data provided by Russia had been ignored.